Transitioning from arches to solid wall? After redoing the main section of the gatehouse, I started to improve on the walls. 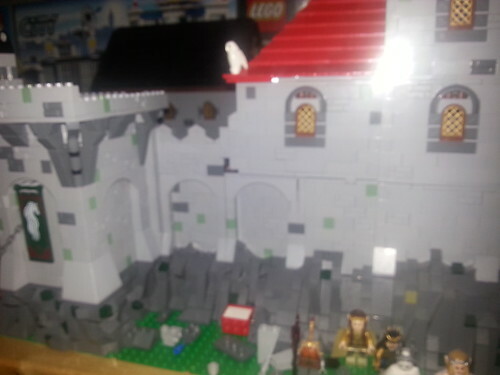 Problem is that I have the whole castle wall already built and changes mean tearing down the walls and the building sections that sit atop them. Also I don't have enough arches to deploy the arches around the whole perimeter. This takes me to my dilemma: how to transition from arches to a solid wall and keep "continuity" / make the transition seem natural? Any suggestions? Ideas? Also is it me or will the top section of the wall look weird if the up and downs are not synced with the arches? Seriously though, I don't think it is a major issue. 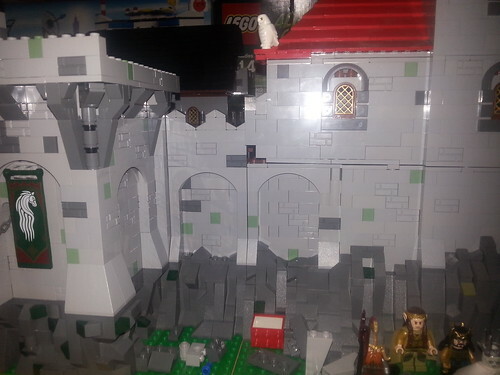 You might protrude or recess the "plain" portion of the wall so that there is some "reason" for the arches ending there, but honestly I would probably just buy more arches, haha. 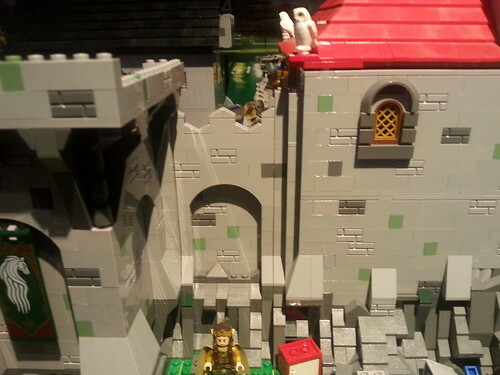 Oh, and I didn't notice that the crenelations didn't match the pattern of the arches, so I guess not a big deal. I think it would help to transition somewhere that a new section begins above it as well. The main reason it sticks out to me now is that it changes halfway through the red roofed section. I think it would look better if there was a 'seam' in the wall to make the change seem intentional. As far as the bits above the arches; I think they would look a little better if they were symmetrical but I don't think I would have noticed if you hadn't asked. Had some time to sit down to it. Definately looks better now though I am dissapointed that the way the floorplan was laid out there is a lack of symmetry in the connection section in the middle. Will need to work on it some more. That looks a lot better. It looks intentional now, instead of "I ran out of arches." Remember that castles were built over long periods of time. Even a single keep and a few surrounding structures constructed "quickly" might take a year or more, but more realistically a whole castle complex might have been built in various phases of construction over multiple decades by multiple rulers (to say nothing of the effects of earthquakes or siege machines). There is nothing whatsoever wrong with having occasional seams, transitions in style, or transitions in the color of the stone; rather, if you do it right, those kinds of details can make a castle look more lived-in and more realistic. In this case, you ran out of a particular part, so I agree that just changing mid-stream might have looked odd, but by making it into a more intentional-looking switch, the finished product looks good.